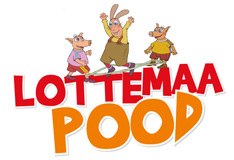 The owner of the online store e-pood.lottemaa.ee (hereinafter referred to as the online store) is OÜ Tuulesosin (registry code 11788882), located at Lottemaa teemapark, Reiu küla Tahkuranna vald Pärnumaa 86508. Goods are shipped to the following countries: Estonia, Latvia, Lithuania, Finland. If a client wants to order goods to any other country in the world not listed, then the shipping price will be calculated manually and the client will be informed of this before payment is made. All shipments within Estonia generally arrive at the destination specified by the purchaser within 3-7 business days of the date of entry into force of the contract of sale. All shipments outside of Estonia are guaranteed to arrive within calendar days. To return the goods, you must submit a declaration of withdrawal to the e-mail address within 14 days of receiving the goods. The purchaser has the right to turn to the online store within two months of the occurrence of a defect by e-mailing or calling . All complaints made by a purchaser about the online store must be e-mailed to kaubandus@lottemaa.ee or submitted by calling +372 56617361.